What’s good? Suomy helmets generally fit my head almost perfectly, and although this one took quite a while to bed in due to the slightly small sizing it now fits comfortably. 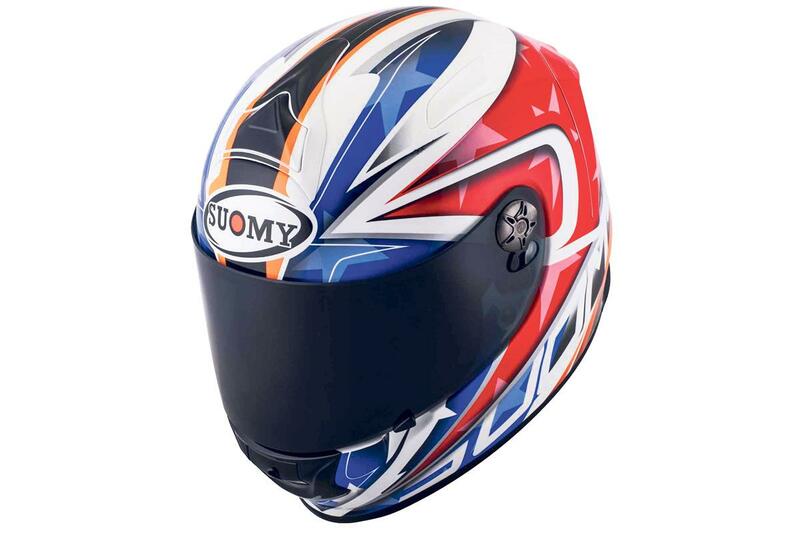 Suomy’s unique visor changing mechanism, which requires the small covers to be removed is simple and quick to use. The vents (one on the chin and one on the brow) are among the best I’ve used. It’s genuinely like turning the air con on when you open them, unlike vents on some other helmets which seem to do little. What’s not? It took a lot longer to bed in than I expected, and for the first few days it put a lot of pressure on my head, but I seem to be through the worst of it now. Suomys aren’t as deep as some helmets I’ve worn, so the chin bar is much closer to my face. For me this has resulted in a misting problem with my glasses and means I’m constantly cracking the visor open. The chin strap digs into my throat a little and can get uncomfortable. The worst part of this helmet is its penchant for pulling my hair out. Because the chin bar is so close to my face, if I remove the helmet by pivoting it on the back and lifting the front up the poppers which attach the chin curtain somehow grab a handful of my hair. The finish isn’t the best, there are a couple of flecks of dirt underneath the lacquer which don’t affect the performance but are annoying.